Fall is well under way in Missouri. Today was a classic example of the season, with cool temps and an abundance of rain. Fall décor has been a bit slow to make an appearance at my house. This evening, I opened the storage boxes and began unpacking pumpkins and candle holders, wreaths and pillows. I had time to really focus on one project. I chose to transform the vintage suitcase from spring/summer to fall, creating this look for the first time with the suitcase and also displaying a central piece for the first time. I have really enjoyed this old suitcase. Last year I brought it out from the closet where it had rested for years and dusted it off. 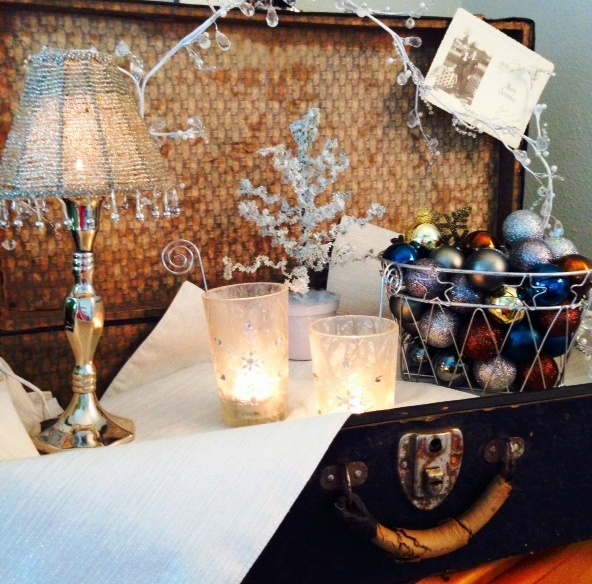 I had such a great time creating a Christmas vignette in my grandfather’s old army truck that I wanted to keep going! 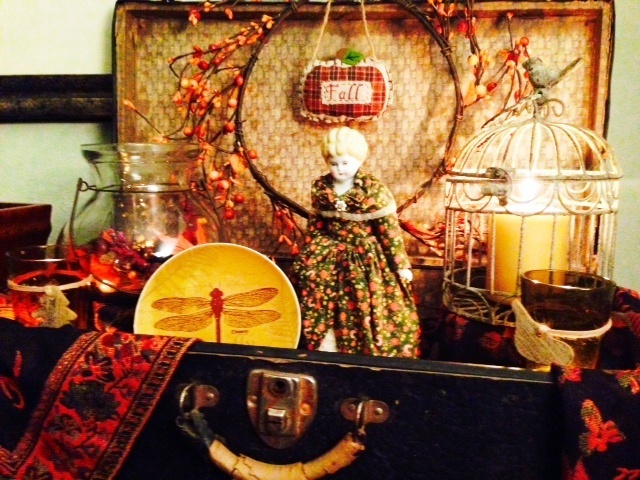 The suitcase is small enough to fit atop my bedroom dresser and large enough to create fun vignettes within it. Tonight I packed away the summery items nestled inside and perused the fall decorations scattered around my dining room. I had already selected one piece that I for sure wanted to include in the suitcase. Greg’s dad recently gave me a very old china doll, that had belonged to his father. Yes, Greg’s grandfather had a doll. And apparently, it meant a lot to him because he kept it, long after his other toys were gone. Before he passed away, he gave this treasure to Greg’s mom, who kept it safe from the grandchildren and on display in her bedroom. I stored the doll in the closet after I received her. I wanted to keep it safe. And, as anyone who knows me well knows, I am not overly fond of dolls. But this one is different. Her china head has yellow china hair. The eyes are painted on and there are no teeth showing! She has a soft body with china hands and feet. I estimate her age to be about 114 years old! I DO NOT want her to get broken. She’s been around far too long to have anything adverse happen to her. However, I also don’t want to keep her stored away in the closet, where she can’t be enjoyed and appreciated. 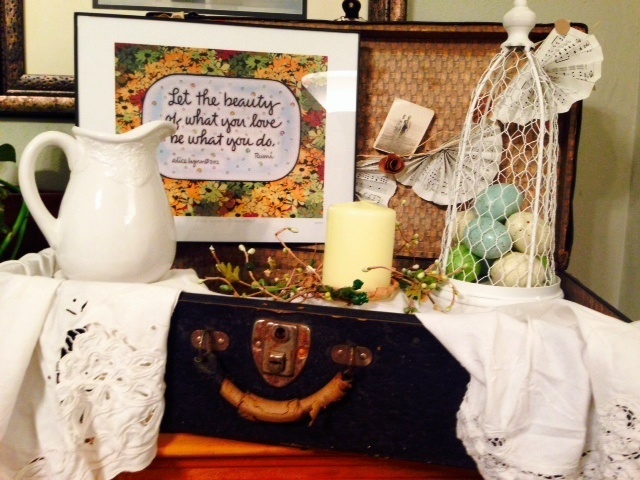 Tonight, she became the centerpiece for the fall vignette in the suitcase. 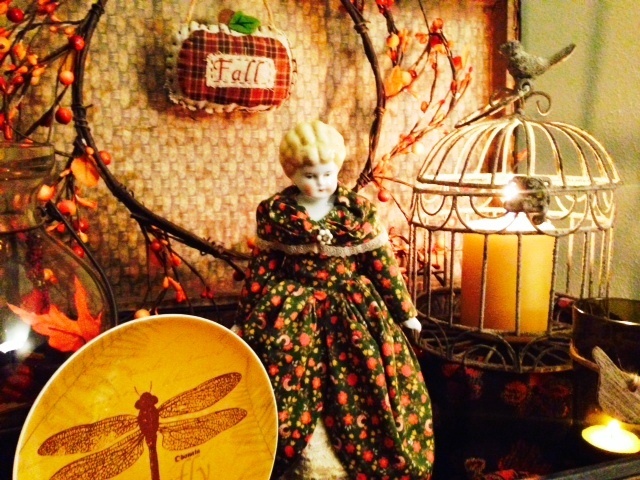 The doll, who as far as I know, doesn’t have a name, is dressed appropriately in autumnal colors. I brought a vintage looking birdcage in from outdoors, added green and orange tea light holders with cute fall cutouts and a blown glass candle holder with fall leaves and berries inside surrounding a mercury votive holder. My golden dragonfly plate completes the lower section. A simple fall wreath adorns the top of the suitcase, along with a small plaid pillow with the word “Fall” on it. I love the way it looks! And I didn’t buy a thing. I especially enjoy creating vignettes with what I have on hand. It becomes a challenge….one I enjoy pulling together. I’ll grab some spare moments over the next few days and pack away the last of summer and then welcome fall throughout the house. I love this time of year, actually, and the transition from fall right into the holidays. For tonight, there is a cozy vignette to greet me in the bedroom. I sure hope that doll likes it there!